Farmers market season is in full swing now, and you can find us at two Richmond,VA farmers markets: South of the James Market on Saturdays (8am-12pm) in Forest Hill Park, or at the Carytown Market on Sundays (11am-3pm) in the Wells Fargo parking lot at the corner of W. Cary and Auburn. 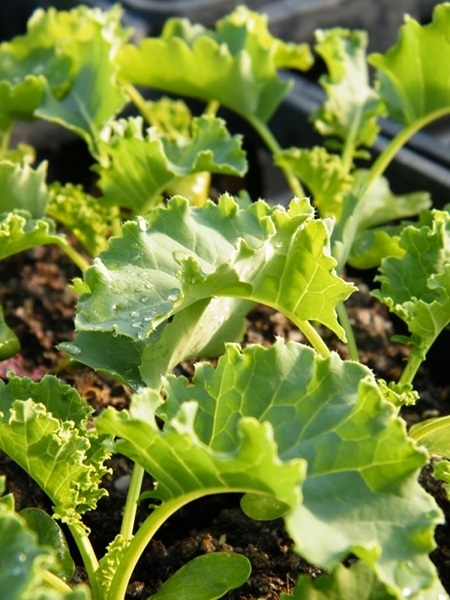 This spring has brought the perfect weather for greens, so stop by the market and try one of our three varieties of kale! 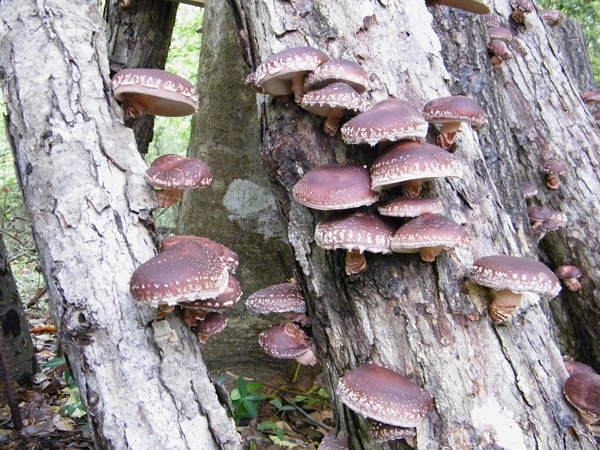 Our shiitake logs have also been enjoying the wet weather and have provided us with a fantastic harvest of mushrooms. If you need a little inspiration for how to cook your ‘shrooms then head over to River City Good Eats and see what Michele Humlan prepared, looks delicious! Next weekend is the first pickup for our Community Supported Agriculture program, and it’s not too late to join, check out the CSA page for more info and the registration form! Our tent at the Carytown Farmers Market. 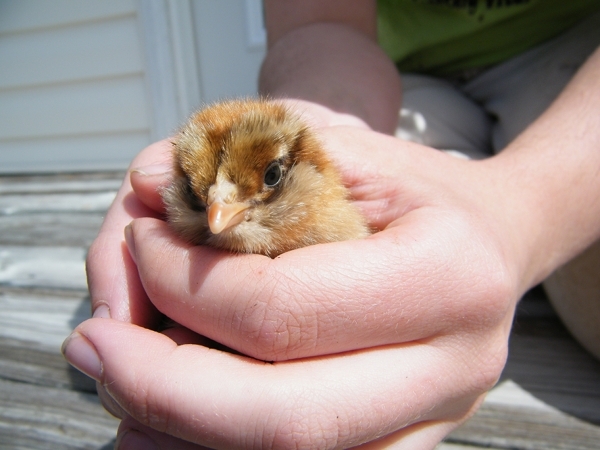 It sure has been busy on the farm, so busy we haven’t even introduced our new laying hens! A little over a month ago these were little more than tiny balls of fluff, but now they are maturing into real chickens. 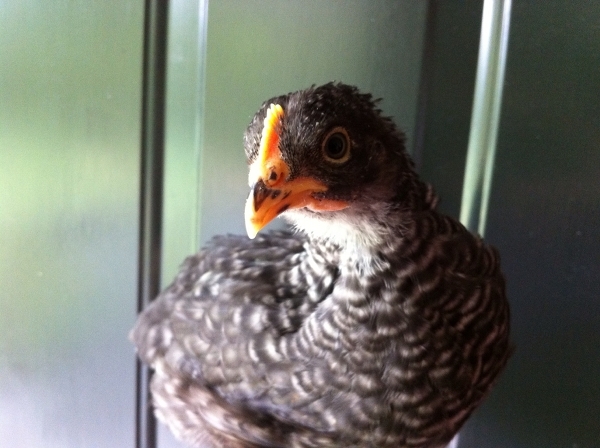 Our new flock is a mixture of three breeds: Barred Rocks, Rhode Island Reds, and Easter Eggers. 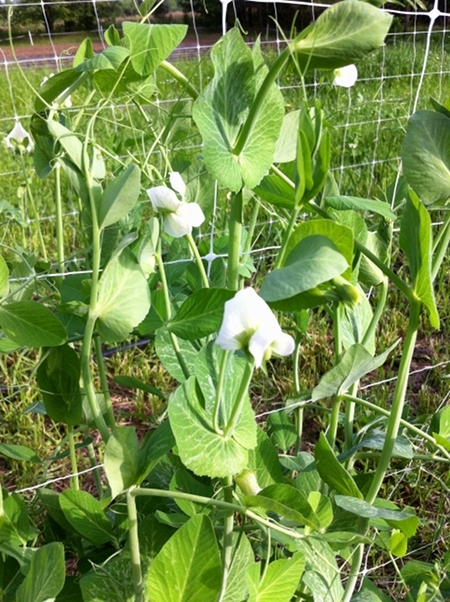 We hope that by early fall these ladies will be providing us and the farmers’ market with fresh eggs. A lovely Barred Rock hen. 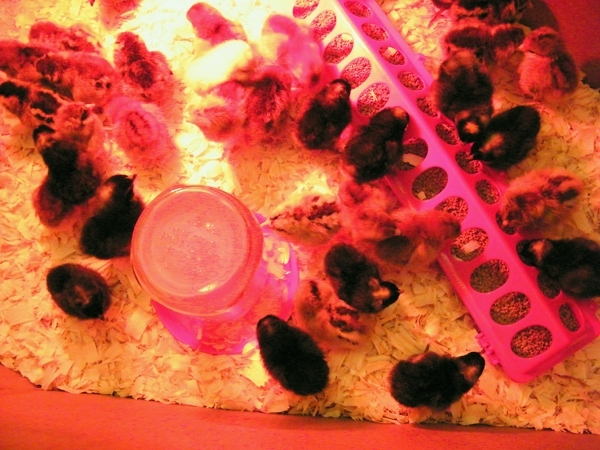 Day-old chicks in the brooder. This spring is turning out to be quite different than last year. I spent some time looking back at the temperatures for 2012 in the Richmond area: the last date with temperatures in the 30’s was March 11th, and we had already experienced several weeks with temperatures in the 80’s! With nighttime temperatures forecast to be in the 30’s the next couple of days, I sure am glad to have a greenhouse. 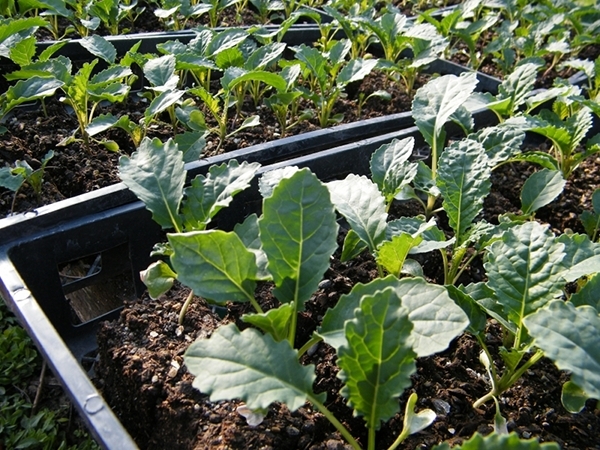 Swiss chard and Kale will survive a light spring frost, but starting them in the greenhouse will speed things up considerably. They’ll be going in the ground soon though, to be replaced by the rapidly growing tomato, pepper, and eggplant seedlings. 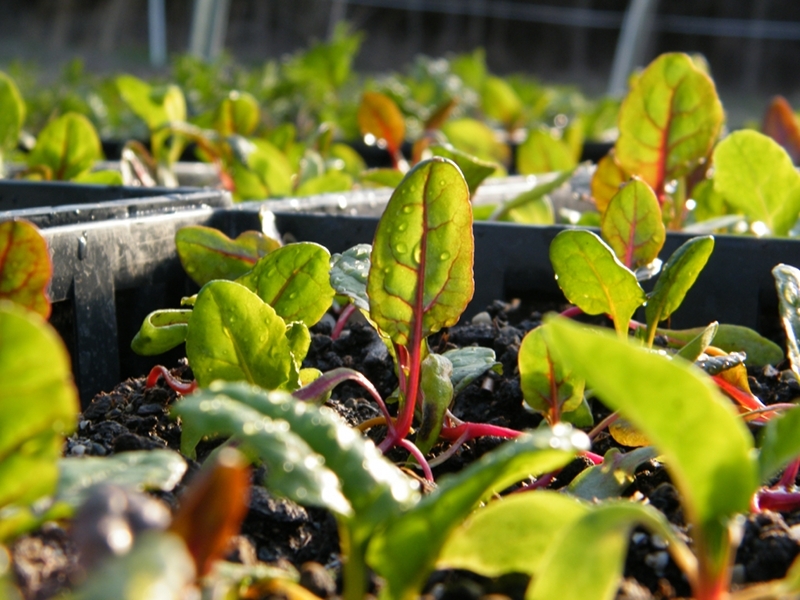 Swiss chard in the greenhouse. Kale as far as the eye can see. 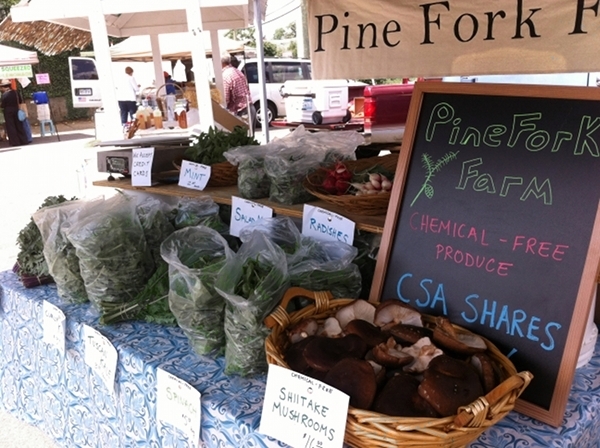 We’ve just received word that Pine Fork Farm will be a vendor at the Carytown Farmers Market this year. The market is on Sundays from 11am-3pm in the parking lot of Carytown Cleaners, 3300 W. Cary St, Richmond, VA. The first market of the season will be April 14th, so mark your calendars! This also means that we are able to confirm the Carytown Farmers Market as a pickup site for the CSA. Shares are still available and you can find the updated registration form and more detailed information here. 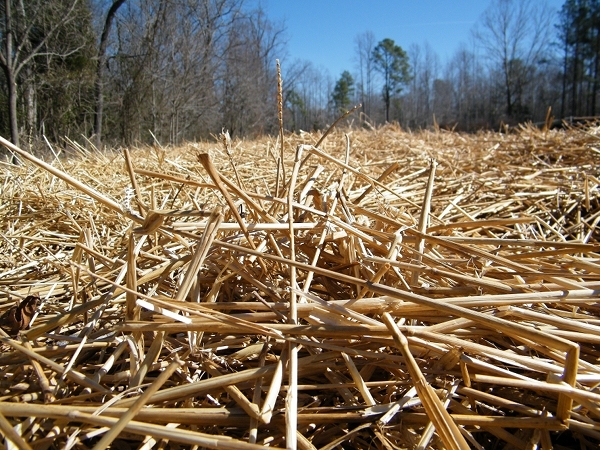 Straw mulch on the asparagus beds. 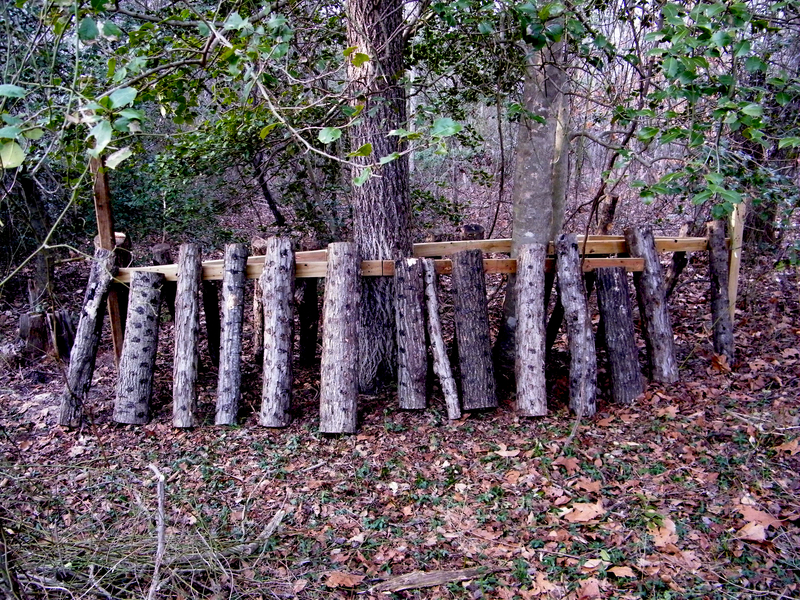 Last week we welcomed the farm’s newest residents: Shiitake mushroom logs! We were able to purchase these logs from our friends over at Root Force Collective Farm who shut down their farm at the end of last season. The logs are dormant during the winter, but should provide us with a crop of delicious shiitake mushrooms for market during the spring and fall. 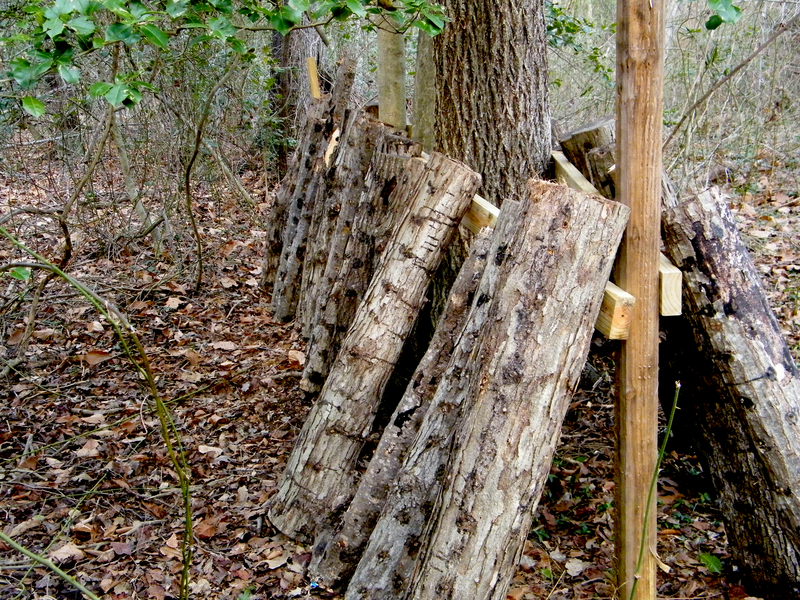 Each log has been inoculated with shiitake mushroom spawn. In other news, if you’d like to see Pine Fork Farm’s produce featured in another of Michele Humlan’s delicious creations, then head over to River City Good Eats! 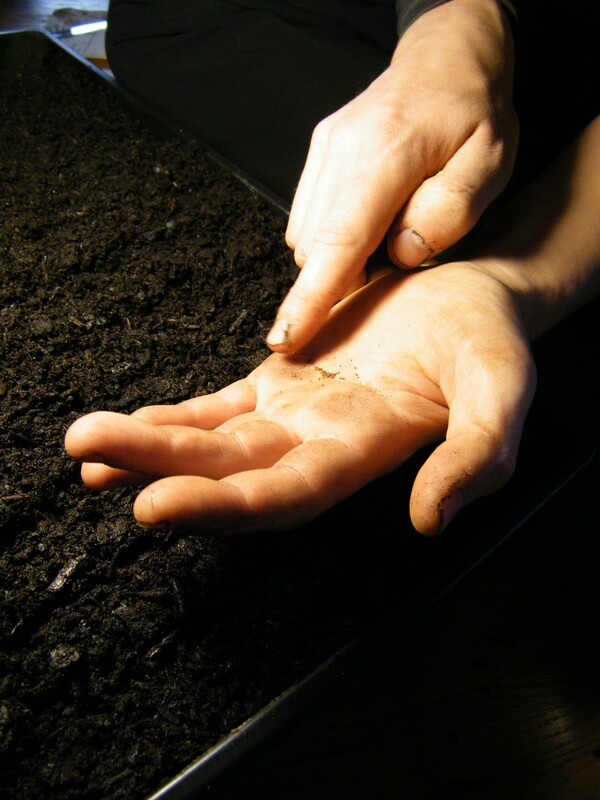 It may seem wintery outside, but we’ve already started sowing seeds! 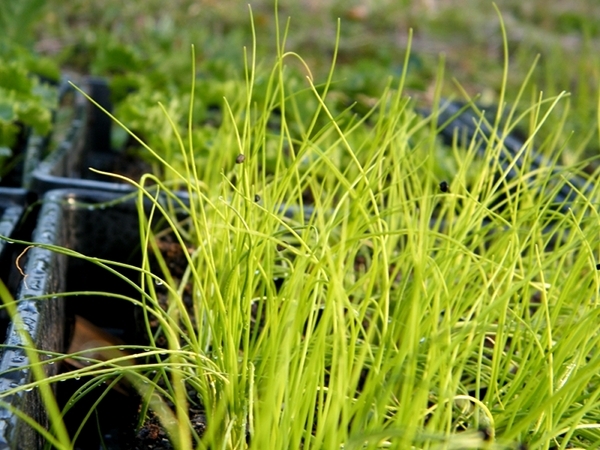 Perennial herbs take a long time to establish so we’re giving them a head start so they will be producing in time for the farmer’s market and CSA. 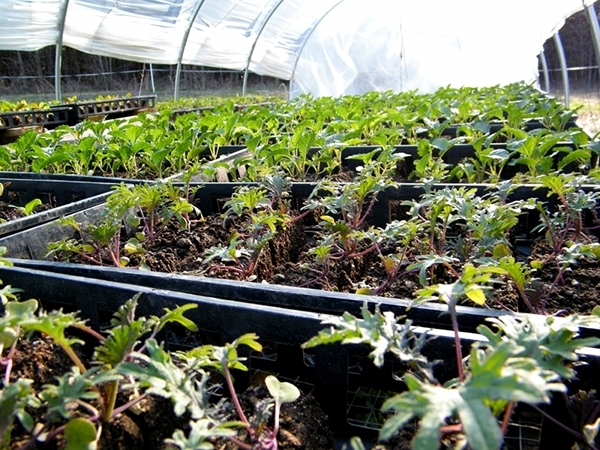 They will spend their first few weeks inside under grow lights before they move out into the greenhouse. 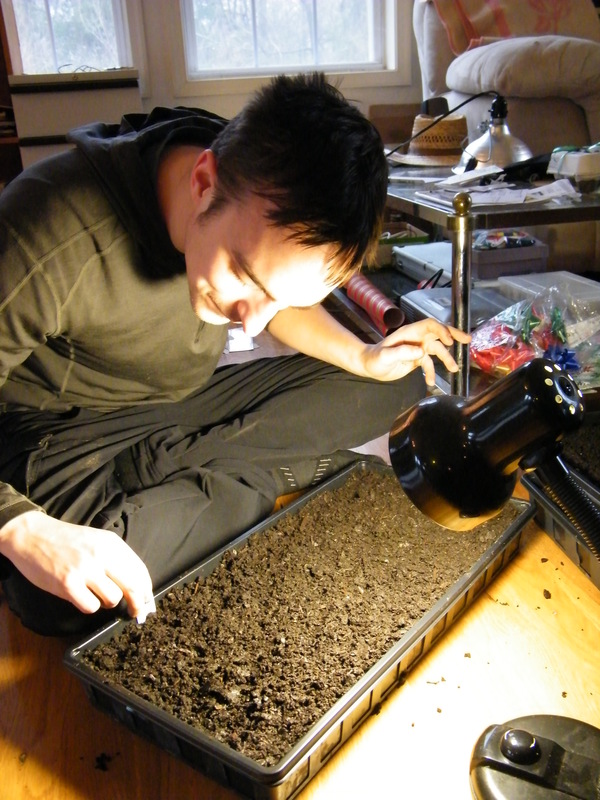 Gus is sowing herbs into trays of potting soil. 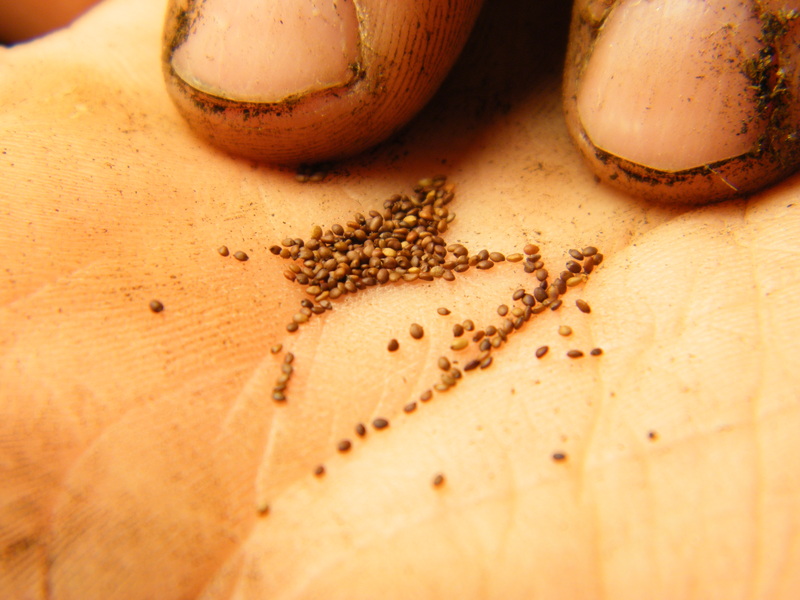 Look how tiny the oregano seeds are! If you’re looking for info on the 2013 CSA, it’s right here! 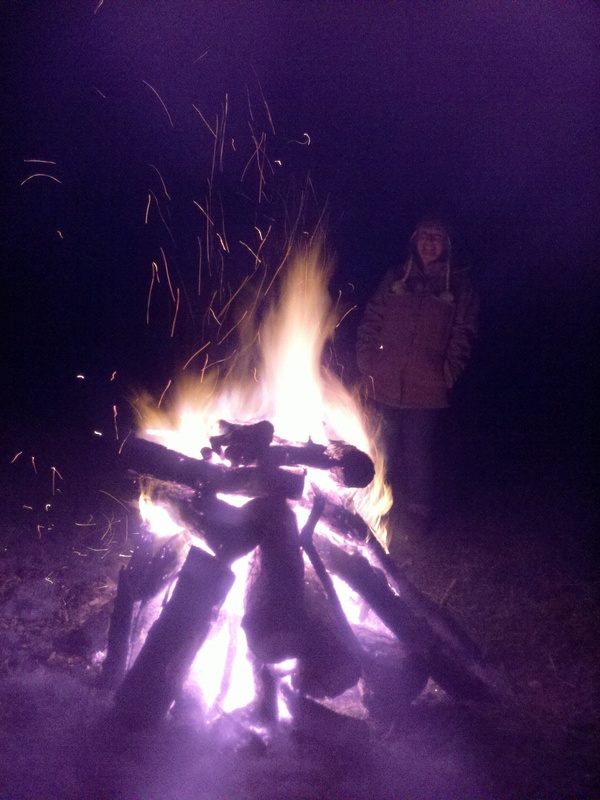 Happy New Year from Pine Fork Farm!